I'm trying to get back in the swing of regular blogging so I'm sharing three photos with you today--three photos related to yesterday morning's hike with a friend. I mentioned that we got some snow this week. One thing I've learned after living in Colorado is that snow on the ground drops overnight temps drastically. When we started at 9am, this was the actual temp...Brrrrrrrrr! I hate being cold. I wore three layers plus my coat and hat and gloves. By the mid-way point, I was burning up even though it had only warmed up to about 20 degrees. Twenty degrees and sun makes for some beautiful Colorado days! And with views like these who wants to stay inside? I'd forgotten what a mess melting snow on a dirt trail makes. My shoes and pants were covered with mud splatters when I got home. I wish you could have seen me trying to bend over and take this picture. I was laughing so hard at myself. Okay. That's all I've got. Hope your Friday is sunny and happy and mud-free! Two blog posts in two days...wow...you'd think I just finished up a big project and found some extra time or something. Grin. Current Books: I haven't been doing much reading lately, but I did love this book! Current Playlist: John brought David Crowder's Christmas album home the other day so I've been listening to it and it's really good. And after the Chris Tomlin concert I went to last week, he's getting a lot of play time too. Current Drink: Good Earth sweet and spicy tea (the caffeine free one) and Zevia caffeine-free cola. And of course WATER. Current Food: Sweet potatoes. And green chilies. But not sweet potatoes and green chilies together. Current Favorite Favorite: Gray nail polish. Ooh-la-la. And a cute brown knit hat that my friend, Terri, gave me. Current Wishlist: A new fleece pullover. Current Bane of my Existence: Laundry. If it would only stop multiplying. Sigh. Current Mood: Happy and relaxed! Current Blessing: My "snow day" yesterday. Oh, and another blessing? I forgot to tell y'all that the issue with my car last week WAS the battery after all so it was a quick and fairly inexpensive fix. Current Outfit: Jeans, sweater, clogs, and SmartWool socks (of course)! It's cold here today! Current Excitement: Well, it's Thursday which means it's almost the weekend! Which means it's almost time for football! Current Link: This post has some amazing candy corn ideas. And I sorta want to try this white-chocolate and candy corn popcorn. I don't have a candy corn addiction. I don't have a candy corn addiction. I don't have a candy corn addiction. I'm hoping candy corn disappears from grocery stores soon because it's getting harder and harder to keep passing it by. Today was the first day in a very, very long time that I didn't make a to-do list. I don't even have words to describe the wonderfulness of that statement. Even without a list I managed to get some stuff accomplished. Slept late. Six-thirty is BLISS for me! Went back to bed. Can't even tell you the last time I did that. Showered and put clean pjs on. Ate a few spoonfuls of Snickerdoodle cookie dough. Yup, RAW cookie dough. It was very sugary and it was very good! Helped Will study for a Spanish test. And I think that's pretty much it. It was an amazingly stress-free day and you have no idea how much I've needed it. I've been going pretty much non-stop for the last four to five weeks. Last night we had the annual fundraising banquet for our area Young Life chapter and I had a key role in organizing the event. The banquet was a great success and we met our financial goal but I was completely wiped out. The weathermen were predicting "significant snowfall" for today so I was REALLY counting on today being a snow day. There was great disappointment when I woke up this morning to maybe an inch or two of snow on the grass but not a stitch on the roads. Our district ended up calling a two-hour delay but I made an executive decision and let the students in my house have a snow day! Snow has continued to fall all day long so the kids and I have had a pretty cozy day. To be honest, we all needed it. Sarah made cookies (AND cleaned up the kitchen!) in between episodes of her favorite show, What Not To Wear. Abbey has been playing, reading, and snuggling up next to me. Will has been studying (he has three tests tomorrow) in between playing video games. And me? I think you gathered from my list that I've been LAZY and HAPPY. Just popping in for a few minutes with some random news from mi casa. We had a great long weekend! I definitely felt rested by the time Monday rolled around. I think we all did! I went to all the kids' parent-teacher conferences last week. I know a lot of parents dread them but I actually enjoy those conferences. I always leave with a sense of gratitude. Gratitude for my kids and their unique strengths and gratitude for the teachers who pour into them daily. 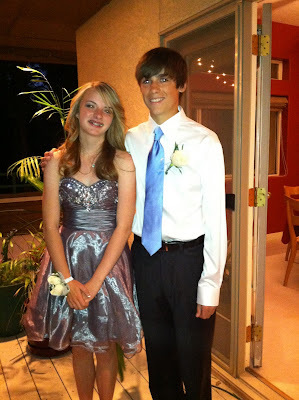 Will had a great time at his Homecoming dance. His friend's parents hosted the entire cross-country team for dinner before the dance and it was so nice. They invited parents to drop the kids off but stay as long as they liked to take pictures. Then they shuttled kids to the dance. I loved that set up. Here's a pic of Will with his "date". You can see their feet but he had on his Vans and she had on a cute pair of sparkly Toms. They're all about comfort! Yesterday morning I was driving carpool and it was cold and drizzly. The kids piped up from the back seat and asked if I had any Christmas music in the car. I found a lone Christmas cd (Jim Brickman) but that wasn't really doing it for them so Abbey found some Glee Christmas on my iPhone. I dropped them off and listened to Christmas music all the way to Denver. It made me happy! I had to be in Denver yesterday for a training meeting for my J-O-B. I hinted at that in an earlier post but it's official now. I'm going to be the administrative assistant for our area Young Life director. It's part-time but it's a perfect job for me and a way to get my feet wet after many years of not working. I think it's going to be a good fit! In other news yesterday...my van is dead. I got back from Denver with about 25 minutes to spare before picking Sarah up from school. I pulled in the school parking lot to wait and catch up on email and phone calls. When Sarah got in the van it wouldn't start! My sweet friend took us home until John could break away from work to help me jump the van. Turns out we couldn't jump it so I don't think it's the battery. We had it towed to the auto repair place and should find out what's going on soon. I AM SO THANKFUL that none of this happened while I was in Denver yesterday morning! SO SO SO SO THANKFUL! Things I'm looking forward to this week? A beautiful hike with friends, crisp fall days, a Chris Tomlin concert, getting some big things knocked off of my to-do list, and a couple of mornings at home! Those little things make me crazy happy!!! hello, friends (and family)(and the rest of you who lurk around here). life is (crazy) busy these days. busyness isn't something i choose but rather seems to come with the territory of having growing children! i'll survive. i don't love it, but i love that our weekends are very low-key and unstructured. i love weekends more than ever right now. will and i went to arkansas last weekend for a mini family reunion and the arkansas-auburn game. we had a BLAST! we saw my brother and sister and lots and lots of aunts, uncles, and cousins. we also saw a fantastic football game. 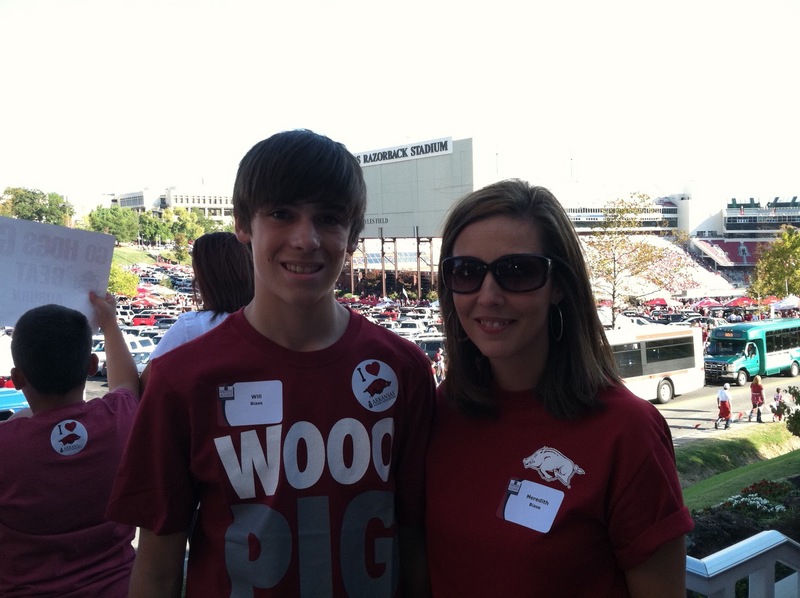 i love razorback football!!! know what happened while we were gone? it snowed at our house in colorado. it was the first snow of the season and we missed it. can't say that i was sad. we had absolutely gorgeous football weather in arkansas. we were in st. louis part of the time. in fact, we flew in and out of there and drove down to fayetteville. i think st. louis is a fun city! we ate some really great pizza at pi (evidently our president loves pi too) and i finally got to go in charming charlie. such a neat store and really great prices! there are a couple in denver but they are not really in the neck of the woods that we frequent. this is a short week of school for my kiddos. the girls are out tomorrow and everyone is out on friday. can you say LONG weekend? i am beyond thrilled about that. let's see...what else is going on??? well, i'm cooking dinner for church tonight. i love being able to eat dinner at church but we've had such crazy evening schedules that it hasn't worked until tonight. we're having chili tonight which is appropriate for our cool fall weather. will has a date for homecoming this weekend at his school. he asked her a few weeks ago. he was so non-chalant about it. i was running to the store for something and he asked if i'd buy him a rose so he could give it to the girl he was planning to ask. she said yes and evidently carried the rose around all day long. anyway, the dance is this weekend (as is the game) and he and his date are going with their whole cross-country team. fun! i'll take pics, don't you worry. it's almost time to start my afternoon kid-pick-up round(s) so i suppose i should sign off. I love lots of things but two of my great loves are FALL and HIKING. I hiked yesterday with two friends (that I also love!) and was stunned by the beauty of that hike, particularly the aspen grove near the summit of Eagle Peak. It was simply gorgeous. So gorgeous that I want to share a couple of photos here. Yesterday's hike stirred my heart in both physical and spiritual ways. The beauty that surrounds me in this place I call home is something I cannot take for granted! This meme is called Fill in the Blank Friday. Today is Tuesday. I guess that makes me a rule-breaker. I'm either a rule-breaker or one busy girl who can't seem to find time to blog without some kind of prompts. Aren't the mountains behind this field awesome? Here's the view from the other end of the field. I have to say that those views are slightly distracting for me. I almost want to stare at the scenery instead of watching the field action. Almost. 2. Hiking makes me happy. Can't wait to hike this morning with some friends! We're doing a very challenging hike that I haven't done in awhile and I am really excited about it. 3. My greatest strength is responsibility. You can count on me. 4. Responsibility is my greatest weakness. You can count on me to get things done...which also means that I end up picking up others' slack because I NEED things to be done and be done well. It's hard to find balance sometimes. 5. My life is very VERY blessed. 6. In high school I was awkward, but surrounded by a GREAT group of friends that remain very dear to me! 7. When I'm super tired I seem to cry at the slightest thing. Also when I'm super tired (like I have been the last week or so) I try to take naps! I took a short one yesterday afternoon and it was just what I needed! Alrighty! Hope your day is a good one.